Sandy and crumbly, as the perfect shortbread should be. Preheat the oven to 350*F (180*C). Cream the butter, then gradually add the sugar, beating well. Mix the flour, salt, and baking powder together and add to the first mixture, combining thoroughly. 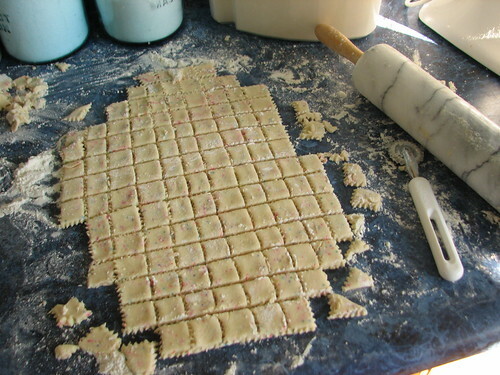 Roll out the dough with a rolling pin until it is 1/8 inch to 1/4 inch thick, then cut into desired shapes. Put them on ungreased cookie sheets, prick each cookie with a fork, and bake for 20-25 minutes or until they turn lightly brown around the edges. 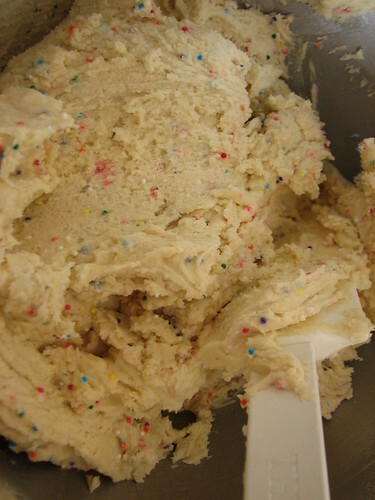 To make “Elfin Bites,” add 1 1/2 T. small, round, multi-colored candy sprinkles to the dough and mix evenly. [I double the above recipe and use 3 T of candy sprinkles.] Roll cookie dough 1/8 to 1/4 inch thick, then cut with a crimping wheel into ½” squares (yes, one-half inch…just big enough for an elf to enjoy). Do not prick with fork before baking. Bake these smaller cookies for 12-14 minutes. 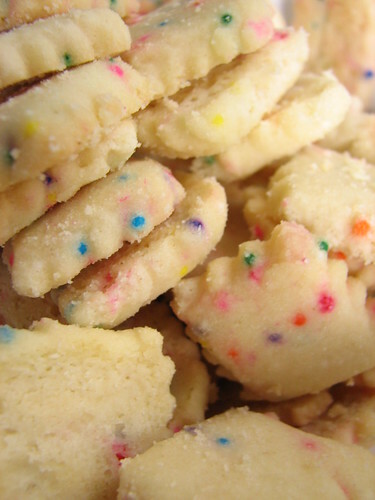 These are very cute piled onto a cookie tray with a variety of other cookies. This recipe is from “The Fannie Farmer Cookbook”, p. 561. I double the above recipe and get about 10 dozen little Elfin Bites. This entry was written by ~~Rhonda, posted on October 16, 2008 at 9:33 pm, filed under cookies and tagged cookies, elfin bites, recipe. Bookmark the permalink. Follow any comments here with the RSS feed for this post. Post a comment or leave a trackback: Trackback URL. i’m hungry for elfen bites……sigh. Those look awesome!It looks like you put gimmies in the dough?I was just wondering how much you add? It’s my birthday today!My wonderful boyfriend surprised me with a Kitchen Aid stand mixer! !He has to go to work for a little while so while hes gone I am going to make some cookies.I have butter out for these and your nutmeg logs.I can’t wait to make them!! !